Today, more than 500,000 children, seniors and people living with disabilities need Medicaid to get access to the health care they need. 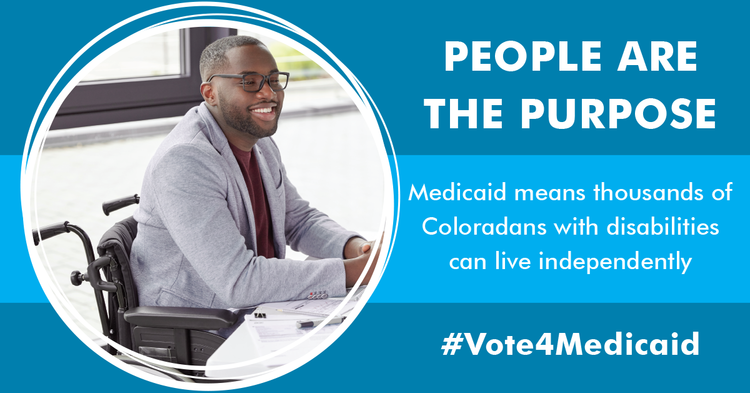 For seniors and people living with disabilities, Medicaid also helps with in-home supports so these Coloradans can live their most independent lives. Our health care system needs Medicaid to provide insurance to thousands of Coloradans who would otherwise go without insurance and care. Medicaid is an important part of the Colorado economy, especially in rural Colorado enabling hospitals to provide critical care. Join the Vote4Medicaid effort if you’d like to help ensure Medicaid continues to serve all who need it.